Over the past thirty years, while the United States has turned either a blind or dismissive eye, Iran has emerged as a nation every bit as capable of altering America¡¯s destiny as traditional superpowers Russia and China. Indeed, one of this book¡¯s central arguments is that, in some ways, Iran¡¯s grip on America¡¯s future is even tighter. As ex¨CCIA operative Robert Baer masterfully shows, Iran has maneuvered itself into the elite superpower ranks by exploiting Americans¡¯ false perceptions of what Iran is¡ªby letting us believe it is a country run by scowling religious fanatics, too preoccupied with theocratic jostling and terrorist agendas to strengthen its political and economic foundations. The reality is much more frightening¡ªand yet contained in the potential catastrophe is an implicit political response that, if we¡¯re bold enough to adopt it, could avert disaster. Baer¡¯s on-the-ground sleuthing and interviews with key Middle East players¡ªeveryone from an Iranian ayatollah to the king of Bahrain to the head of Israel¡¯s internal security¡ªpaint a picture of the centuries-old Shia nation that is starkly the opposite of the one normally drawn. For example, Iran¡¯s hate-spouting President Ahmadinejad is by no means the true spokesman for Iranian foreign policy, nor is Iran making it the highest priority to become a nuclear player. Even so, Baer has discovered that Iran is currently engaged in a soft takeover of the Middle East, that the proxy method of war-making and co-option it perfected with Hezbollah in Lebanon is being exported throughout the region, that Iran now controls a significant portion of Iraq, that it is extending its influence over Jordan and Egypt, that the Arab Emirates and other Gulf States are being pulled into its sphere, and that it will shortly have a firm hold on the world¡¯s oil spigot. By mixing anecdotes with information gleaned from clandestine sources, Baer superbly demonstrates that Iran, far from being a wild-eyed rogue state, is a rational actor¡ªone skilled in the game of nations and so effective at thwarting perceived Western colonialism that even rival Sunnis relish fighting under its banner. For U.S. policy makers, the choices have narrowed: either cede the world¡¯s most important energy corridors to a nation that can match us militarily with its asymmetric capabilities (which include the use of suicide bombers)¡ªor deal with the devil we know. We might just find that in allying with Iran, we¡¯ll have increased not just our own security but that of all Middle East nations.The alternative¡ªto continue goading Iran into establishing hegemony over the Muslim world¡ªis too chilling to contemplate. The conventional wisdom in the Middle East is that Iran is a rogue state run by religious fanatics who want to wipe Israel off the face of the earth and drive the U.S. and other Western powers out of the region. 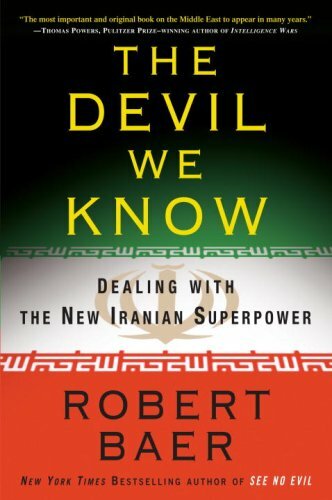 The reality, according to Robert Baer in his new book "The Devil We Know: Dealing with the New Iranian Superpower" (Crown Publishers, 288 pages, $25.95) is much more complicated and subtle -- and dangerous. He says we must deal with reality -- with "The Devil We Know" -- or find our access to Persian Gulf oil eliminated. The Shia regime in Iran is halfway to winning its undeclared 30-year war with the U.S. which began with the overthrow of the Shah in 1979 by using proxies such as Hezbollah and the Kurds, forging alliances with Russia and China and exploiting the Muslim divide of Shia and Sunni factions, Baer says. He's a former CIA operative whose character was played by George Clooney in the movie "Syriana," based on Baer's book "See No Evil." He has extensive contacts throughout the Middle East, including Israel, which he says is pursuing a realistic approach to Iran since its defeat by Hezbollah in the 34-day 2006 war in Lebanon. Baer quotes -- on Page 109 -- an assessment from the Winograd Commission Report, the official Israeli investigation into the 2006 war: "A semi-military organization of a few thousand men resisted for a few weeks, the strongest army in the Middle East, which enjoyed full air superiority and size and technological advantages." Baer -- now a free-lance journalist and author of four books who contributes to Time.com, Vanity Fair, the Washington Post and the Wall Street Journal, among other publications -- says there is still time to counteract the Russia-China axis and forge relations with what is in effect a superpower. In their own peculiar way, the majority of Iranians like Americans and America, something I noticed while living in Los Angeles and interacting with the large Iranian exile community there. What about the looney-toon president of Iran, Mahmoud Ahmadinejad? Baer argues that he's a figurehead, that the country is run by a secretive, calculating, rational shadow government that has succeeded in controlling the Shia areas of Iraq and has gained credence with the Palestinians, Jordanians and many in Egypt and the Gulf States because it has done what Sunni Muslims have never done -- defeat the mighty Israelis. Iran's interest in its neighbor Iraq is "considerably stronger and more enduring than America's," Baer says on Page 93. "...its will is stronger, and it never will overcome the temptation to meddle, to undermine us in Iraq. Iran also cannot afford to allow Shia Islam's historical center of learning in Iraq, Najaf, to return to being a moderate rival to the Iranian learning center, Qum. Iran will not abandon its quest for control over Shia Islam, nor allow a quietest form of Shia Islam to challenge the legitimacy of Iran's mullahs." Iran, Baer says, thinks in terms of the long haul: "Iran is calculating that the United States will get tired of Iraq, pull out, and let fall the first domino in a Persian reconquest of the Gulf." (Page 104). "The Iranians understand perfectly that the only reason we care about that miserable body of water called the Persian Gulf is that 55 percent of the world's reserves lie beneath its shores and 17 million barrels of crude oil pass daily through the Strait of Hormuz." Iran is little interested in becoming a nuclear power, for now, Baer argues in a startling turnabout of conventional wisdom: "Right now, at least, the Iranians don't need a nuclear bomb [Page 110]. If a war is to be fought in the Gulf, Iraq, or Lebanon, Iran will almost certainly fall back on its asymmetrical tactics and weapons. There are also innumerable drawbacks to rushing the development of a nuclear weapon in today's global atmosphere --and few benefits." Baer's says one reason the U.S. is obsessed with Iran's supposed nuclear ambitions is that "we're once again fighting the last war rather than this one [Page 110]. We remember it was Saddam Hussein's chemical weapons that stopped Iran from taking Basra. We're worried that the Syrians intend to put chemical warheads on their Scud missiles and fire them at Tel Aviv. We're blinded by the worst-case scenario, which happens not to be Tehran's preferred scenario." Not that Baer rules out Tehran's developing nuclear weapons; he argues that Iran wants to counter Pakistan's "Sunni Bomb" with its own "Shia Bomb." Too, Iran "wanted to be taken seriously as a major power, in the same way it wanted to control Hormuz and the world's oil [Page 111]." Among Iran's proxies are the Kurds, who inhabit a strategic region encompassing major parts of Turkey, Iraq and Iran, Baer says. It's only a matter of time, he says, before the artificial state of Iraq -- developed out of the 1916 Sykes-Picot secret pact by the British and French in their dividing up of the Middle East into spheres of influence -- is split up into Kurdish, Sunni and Shia elements. Iraq's civil war has just started, Baer says: The Shia intend to fight until their former masters, the Sunni, are expelled from Baghdad and central Iraq. The Shia already control Basra and southern Iraq. Summing up, Baer says the longer we ignore Iran, the more dangerous this sophisticated country with a history dating back thousands of years will succeed in ousting the U.S. from this volatile region. One might argue it's too bad we don't have Baer as Secretary of State! But that would make too much sense, and we're not especially noted for common sense in the Middle East. If you're looking for a clear-headed, rational look at the Middle East, read "The Devil We Know." It turns conventional "wisdom" on its head. Of the three options Baer outlines for dealing with Iran -- Staying in Iraq forever; provoking a "Mad Max" Shia-Sunni civil war; or sit down at the negotiating table with Iran, "treat it like the power it has become, and see what it has to offer" the latter is the only sensible course of action, he says. Baer's thesis is that Iran has reached such a powerful position in the Middle East that it is futile for the U.S. to contend with it. He believes that the U.S. must dialogue with Iran and in such a way ensure their mutual best interests. Baer believes that this will help the U.S. have a buffer against growing Chinese and Russian power. Baer is an expert on Saudi Arabia and its fanaticism and corruption. His sense of the strong Shiite- Sunnite conflict is that the U.S. has wasted resources in supporting the tacitly anti- American Saudis. Baer is especially troubled by the idea of a war between the U.S. and Iran in the Gulf which would lead to a world energy crisis. Baer reads the Iranians as pragmatic and cautious, and that their extreme ideological rhetoric is just that. But in fact Iran is the leading terrorist nation in the world. ( Baer makes a strong case that Saudi Arabia in its exporting Wahhabism is). Iran is a self- defined Islamic Revolutionary regime. It has defied the world in its push for nuclear weapons. And there has been no sign whatsoever that they will stop developing their nuclear program. They have in any negotiations with the Americans including those in 1979 at the very beginning showed contempt for the Americans, and also dishonesty. They too have an Ideology which makes the U.S. the Big Satan. I just do not see them agreeing to any kind of real detente with America except for temporary tactical purposes. They wish to drive the U.S. out of the Middle East and become the main power controlling the world's energy sources. Once again, Baer comes flying in with the sorry-but-it's-true reality of the Middle East. I've read all his books and couldn't wait to read this one. The first two dealt with exposing what Saudi Arabia is really up to and their involvement in terror and, most importantly, why it is beyond insane to call them an "ally." Now he takes on Iran and details in very convincing manner (having dealt with Iran for decades) how Iran is much more powerful in the region than we currently believe, and how all this talk of them being the third prong of the "Axis of Evil" that is going to nuke Israel is completely 9/10 thinking. He correctly summarizes how they, via Hezbollah, were able to beat Israel in the 2006 war and galvanized public support for them. He also points out, which is pretty obvious, how they have immense sway over Iraq and its Shia majority. What's eye-opening is his pointing out that Hezbollah/Iran hasn't launched a terror campaign (meaning, bombings, kidnappings) since the 80s because there's a "pragmatism" to their thinking and they realized this kind of thing wasn't helping their cause. And what is that cause? To be, and be realized, as the superpower in the region. NOT to wipe out Israel, not to do anything that the fool Ahmadinejad keeps talking about, not to eventually bring Islam to our doorstep and force it down our throats. The epiphany of the book is that Baer positions Iran not as an enemy to be attacked or feared, but rather a historic opportunity to form an alliance in the region. Time is ticking, he asserts, and do we really want to cast our lot with the zealot Sunni Muslim "takfiris" who have wreaked destruction for decades (including 9/11) and have no other goal except destruction and using the Koran as their Constitution? Because that's who we're partnered with now. Or, do we form an alliance with a country that doesn't share that ideology at all, and who can provide dividends in settling Iraq and, yes, Israel/Palestine? He makes a good case. Read and judge for yourself. I can't recommend it enough; too bad our leaders aren't reading it also. If you're REALLY interested to know what time has reserved for world in the Middle East, then this is definitely the book to read. This book provides you with an analysis of why Iran is the hegemon of the Middle East, how it has succeeded to maneuver herself to this position against all the odds, and why USA supporting other countries of Middle East is simply illogical and bad investment. We've Already Lost, and Don't Even Know It! Baer's book starts out by making a number of seemingly wild and unfounded claims; unfortunately, (for the U.S., not readers) he then proceeds to document them quite well. Baer sees Iran as engaged in a soft takeover of the Middle East - it now controls a significant portion of Iraq, is extending influence over Jordan and Egypt, and has the ability to wreak havoc over the entire Middle East. Baer's conclusion is that destroying Iraq was the greatest strategic blunder this nation has ever made, and we should now ally ourselves with Iran instead of continually goading it. Our first problem in dealing with Iran is that we don't understand it. Its population growth has fallen from 3.2% in 1986 to 1.2% in 2001, only slightly higher than the U.S. Further, its religious parties generally only receive about 10% of the vote. Iran's current belligerence can be traced not to innate aggression, but the fact that wars are being fought on two of its borders. American are not hated in Iran - just that we occupy large portions of the Middle East. Iran got the confidence that it can beat the West from its 1982-2000 experience in Lebanon, when its proxy Hezbollah forced the Israelis to retreat. Iranian surrogates have already started to take control of Iraq's oil by stealing hundreds of thousands of barrels/day, as well as getting Iraq's Shia oil minister to cancel Kurds' oil contracts because Iran does not want to strengthen that group. Saddam's T-72 tanks and helicopters were all that kept him from falling; without those resources, whatever regime replaces him will not be able to hold the nation together. The U.S. further acerbated control problems by allowing Iran to take over from moderate Shia clerics via assassinations and taking over various sect bank accounts. Baer expects Iran to play off the differences between Iraq's major Shia parties and use Iraqis that had been exiled to Iran, imposing its own order through money and arms. Meanwhile, its objective is to bleed the U.S. so it will not interfere with Iran. Iran has armed itself via fire-sale prices from Russia - new and refurbished tanks with heat-seeking missiles, MIG-29s with accompanying missiles, and Chinese missiles. Much of this armament is buried underground. Fiber-optic cable technology that can't be intercepted is used for communications, and of course they are well known for having learned to create EFPs (explosively formed penetrators). Finally, in 2007 Iran sent emissaries to all Gulf states telling them that if the U.S. attacks us we will destroy your oil facilities. Thus, Iran doesn't need nuclear weapons to play an important role. Iran is further strengthening itself politically and economically by signing a 25-year large natural gas contract with Turkey, and allowing Turkmenistan to transport its natural gas across Iran to markets. Baer further believes that Iran will be able to control a proposed gas pipeline from Turkmenistan to Pakistan, and that a similar situation is arising with Caspian Sea oil. Meanwhile, the Straits of Hormuz across from Iran through which at least 20% of world oil flows are only 21 miles wide. Iran is the overwhelming military force in the Gulf region, capable of quickly putting one million into uniform; Saudi Arabia, the next largest force, can field only one-quarter that force. Iran could quickly take over Saudi Arabian oil fields, and though eventually be pulverized by U.S. air forces, the resulting damage would seriously impede oil flow for two years. On the other hand, Baer does not believe Iran has to invade to create chaos. The Persian Gulf rim is populated by 90% Shias and vulnerable to Iranian meddling. Oil-rich Dubai is mostly Shia, and Baer foresees they could overthrow the rulers and call for help from Iran. Consensus in the Gulf is that the first Arab sheikdom to fall will be Bahrain, with a tap by Iran. Its population is 700,000, 70% Shia, and Iran funds its Shia clerics, charities, and schools. Further, until 1782 it was part of Iran. Losing Bahrain would force the U.S. Navy to relocate to the Indian Ocean. What does Iran really want? Baer says they primarily want to unify with parts of Iraq, and to be left alone by the U.S. As for sanctions aimed at bringing regime change - its regime still stands after 30 years of sanction, and Turkey and Japan ignore the sanctions entirely. An original view of Iran and the U.S. This is a unique book that should stimulate thoughtful debate among serious people. I don't agree with Mr. Baer that Iran is a a "super power". He does make some serious points, however, that are often obscured by western debate about Iran. There is a growing divide in the Islamic world about the Shia "revival". The American invasion of Iraq has created a true revolution inside Islam but not the one Bush and his crowd planned to create. For the first time in Islamic history, Shia Islam dominates two major Islamic states. It is particularly galling to Sunnis that Iraq is now a Shiite dominated state since Baghdad was the capital of the Islamic caliphate in the Middle Ages. As for the need to do more to explore negotiations with Iran, this is an idea supported by many foreign policy experts. People forget that due to its hatred of the Taliban regime (which it almost went to war with) Iran supported America's efforts to crush the Taliban in 2001. As pointed out in Bob Woodward's new book The War Within: A Secret White House History 2006-2008, the Saudi King is absolutely furious with the reality of a Shia state in Iraq. I'll leave to others to debate the exact manner America should negotiate with Iran. My point in writing this review is to alert people to the growing divide in the Islamic world. Ignorant attempts to lump all Muslims and all Islamic "radicals" together as is being done in the popular media is not only idiotic but dangerous. Iran and Saddam Hussein's Iraq were never in an "Axis of Evil". They fought two wars with each other that killed over a million people. I don't agree with all in this book but it is a useful work to stimulate debate. This book has value as a reference to assist in the understanding of the players involved in the Middle East and how they interact/relate to each other. There is a lot of good information on how many of the players came to reach their current positions of power and how positions of power were lost. And the author is correct in that the West (and the US in particular) doesn't understand Iran and it's internal workings and the core differences between Shia and Sunni factions. The problem is that the author doesn't seem to be learning from the lessons he presents in his own book. The conclusion he reaches is that we should abandon any Sunni relationship (Pakistan, Saudia Arabia, Oman, etc) we currently have in favor of aligning with Iran and the Shia. Why? Because at the moment, the author believes the Shia are 'winning' and it's best to align with the 'winner' who can consolidate and control the Middle East as our 'partner'. This whole theory leads to disastrous results because, as the author points out repeatedly in the book, the Iranians have no interest in being subservient to the US (which a paranoid society such as Iran would view any partnership which wasn't completely dominated by the Iranian side) and in general can not be trusted due to the core fundamental belief that deception is just fine as long as its viewed as neccessary to defend Islam.